We're having a Smurfs revival! There's a new Smurfs movie and the little blue guys are everywhere! Lots of kids are asking for a Smurf or Smurfette birthday party. On this page you'll find Smurfs party supplies and ideas for Smurf party games and activities to keep kids entertained. 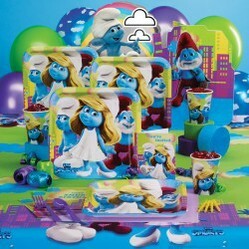 This Smurfs Deluxe Party Pack for 8 includes Smurf invitations, Smurf tableware and matching decorations. You can choose from a basic set, deluxe set of a complete set including party favor boxes. Fans of the Smurfs and especially Smurfette will love this set. This Smurfs Party Favor Box make is easy to give your party guests some cool Smurf-themed gifts to take home. Saves some time when you're preparing. Set up a table with blue Play-Doh. Everyone loves playing with Play-Doh. You can add smaller tubs of white, yellow and red so the kids can make Smurfs, Smurfette and Papa Smurf. You can give prizes for the best. Make Smurf masks from blue construction paper. Either attach to a stick or provide elastic or string. Depending on the age of the kids you can either pre-cut the mask shapes or let the kits cut them out. For Smurfette draw on some eyelashes with a black Sharpie. You can use this Smurfs Child's Hat for a variant of pass the parcel. Instead of passing the parcel, you pass the Smurf hat. Children put the Smurf hat on then take it off and pass it to the next child. The child wearing the Smurf hat when the music stops gets a small prize and the child wearing the hat at the end of the song gets to keep the Smurf hat or gets another prize. Word Smurf. Get a pack of word flashcard or just print a list of words and cut them out. Each child takes a card and when it's there turn they have to come up with a sentence in Smurf language using the word. E.g. if they got the word cookie, they might say 'I Smurfed a cookie.' Give a small prize for each correct sentence. Smurf one Out. Write the names of Smurfs on cards and also include Gargamel. Spread the cards out around the room so there is one card per child including Gargamel. Play music and when it stops all the children have to run and stand on a card. The one that gets caught by Gargamel is out. It's always good to have some music at a party. You can play Smurf music as the kids arrive, as a backdrop to activities and for use in musical games. Soundtrack Album, CD, The SmurfsThis product is manufactured on demand using CD-R recordable media. Amazon.com's standard return policy will apply. The Smurfs Dance Party for Nintendo Wii is a great game for smaller groups and sleepover Smurfs parties. How about Twisting Smurf Balloons? The birthday child and guests will be very impressed if you can twist Smurf ballon models for them! These videos show you how to make Smurfette and Papa Smurf. Very cool! You can use your Smurf balloons for decoration and as party favors. Or if you really master balloon twisting you could make them live to entertain the kids. The perfect balloon for balloon sculptures. Packaged in an assortment of bright colors. These are every balloon workers' product of choice. 100 per bag. Stock up! It's also worth looking for Smurf party favors and supplies on eBay. Look out for Smrufs stickers and temporary tattoos, smurf charms, necklaces and buttons and Smurfs candy. Do you know a child who would like a Smurfs party? I'm loving hearing about the Smurf parties! I hope everyone has lots of fun. My son will be having a Smurf birthday party on December 17th, 2011!! Find lots of Angry Birds Party Supplies for a brilliant birthday. Angry Birds make a super fun theme for a party. Need ideas, invitations, decorations and favors? Look no further.